The Intelligent Ant - Something New Everyday! several times more than its size. The man watched it for more than an hour. took a diversion and then continued towards destination. 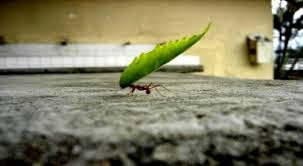 walked over the leaf, picked the leaf on the other side then continued its journey. The man was captivated by the cleverness of the ant, one of God's tiniest creatures. a tiny hole in the floor which was an entrance to its underground dwelling. large leaf that it had managed to carefully bring to the destination? large leaf and went home empty-handed. had no option, but to leave it behind to reach its destination. The man learned a great lesson that day. that at the end they are useless and we can't take them with us.